Beautiful upgraded condo with a covered terrace, located on the owners only floor, which is on the top floor. There is an elevator to bring you straight from your reserved gated garage parking spot to the 4th floor. 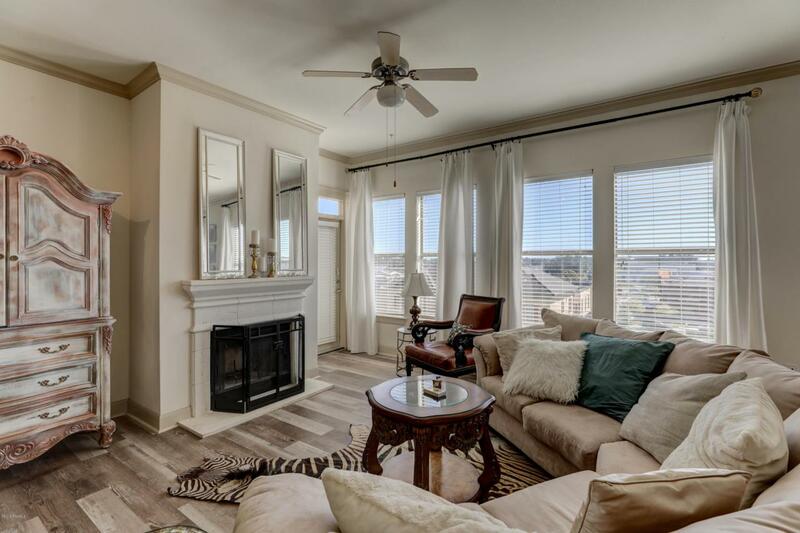 Condo offers: Open split floorplan, 10-foot ceilings, Wood flooring in living and dining, Woodburning fireplace, Tons of storage space and High-grade carpeting in the bedrooms. Kitchen with granite counters, pantry, stainless steel appliances, microwave, dishwasher, refrigerator, breakfast bar and lots of cabinet space. Large laundry room off kitchen includes washer and dryer. Furniture, decorative items, linens, china, silverware can be purchase separately. There is also a step-saving trash shoot located on the floor.The views are spectacular overlooking a Water Fountain, Broken Egg and CC's Coffee on Rue Promenade. If you are looking for super convenient living with everything you need within walking distance this is the place for you! Enjoy the convenience of the neighborhood market, dining, shops and recreation. Easy living at its best in The Village of River Ranch at MainStreet!! !